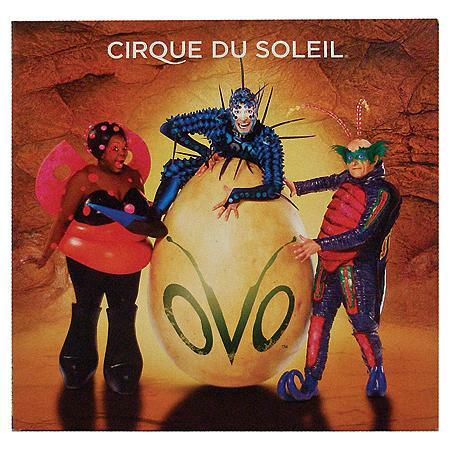 Gust Gab: Cirque du Soleil - OVO! ~ A Give Away! Cirque du Soleil - OVO! ~ A Give Away! Are you going to see OVO while it's in town at Mall of America? OR...remember awhile back I told you about a little known secret called GOLDSTAR? Be sure to sign up for FREE Goldstar Offerings...and I happen to know that they are offering discounted tickets to OVO! Hurray for discounts and hurray for awesome outings right here in our city!! But better than discounted tickets? Oh yes...BETTER! Simply leave me a comment here telling me that you'd like to win! ** Bonus entry...Are you a fan of this here blog on Facebook? Please leave me a separate comment for each entry for ease of use via random.org ~ this give away closes at midnight on Friday May 27th. The winner will be contacted via email on Saturday morning & must respond to me that they can attend and will be picking up their tickets at Will Call before the show on Tuesday May 31st. Obviously not an entry, but I'm guessing that I'll see you on Thursday night :) I'm so excited too! Would love to win these tickets! Sounds like a great show!!! This is my entry for this blog post! And now I am entering because I just "liked" the blog on Facebook! And just now I tweeted about the give away! D, this is awesome! I so wanna go! Can we go with you guys if we win?? And I definitely like you, sweetie, on facebook, in real life & everywhere! Oh wow! I would LOVE to go see this! It sounds like an amazing show!!! So, so cool. I too have always wanted to see a Cirque show! I would love to win tickets. I would LOVE to win some tickets to OVO! My family would be so excited to go! I wanted to buy tickets, but they are pretty expensive for a family. I also "liked" you on Facebook, for an extra entry! Would love to take the boys to see this...I think they'd love it!! Ever since I got word of this event I've been interested! Would love to go! I also like your blog on FB! Fun - I totally want to go! I would LOVE to win tickets! :) Please enter me in the drawing! Oooh, pick me, pick me!!! :-) I'd love to win! Way cool giveaway. I would LOVE LOVE LOVE these tickets! I love Cirque! Just liked your fanpage. Glad to find you, look forward to reading more from you in the future. Just tweeted about your giveaway. Hope I win would love to go!!! I would love to win tickets and take my 6-yr old daughter to this. Cirque du Soleil is amazing! Just tweeted about your give-away. I would love to be able to take my family to OVO. My two boys and my husband and I would all love to go. Darcie I think I did it!! Now I can participate in all your fun activities!! Hugs to H & D!! I'm entering again because I already like you on facebook - and everywhere else! My family would love the tickets and 4 would be perfect! And another entry for "liking" your page! I would love to win!! Love your blog too. Would love to win. Haven't seen a show but looks awesome! Plus my 9 yr old would love it too. Would love love love to go! These shows are amazing. I'd love to win the tickets. I am going to follow your blog and like you on Facebook. I have never been to this circus but would love to go. Thanks for the chance to win. I would love the opportunity to win the tickets! Looks like a great show. Thanks so much! Pick me! Pick me! I really want to go! This show would be so fun to see. Thanks for holding this giveaway. I would love to win the tickets to Circus...never been to one myself. Also became your friend on FB.... :D Have a great Memorial Day weekend! this is a great giveaway my boyfriend REALLY wants to go to this show! I would love to see this show with my kids! I would love to win tickets!!! I'm a cirque virgin and would love to see a show!